"I have a plethora of great titles on interpreter training in my library. 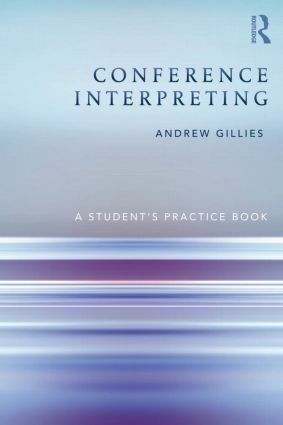 But if someone were to ask me what book I would want with me if stranded on a desert island, and if I had to train interpreters, the answer would be easy: Conference Interpreting: A Student’s Practice Book by Andrew Gillies." - Barry Olsen, The American Translators Association Chronicle, September 2013. Andrew Gillies is a freelance interpreter working primarily for EU and European Institutions in Brussels, Paris and Munich. He has taught conference interpreting in Poland, Germany, the UK and currently teaches in France.He also trains interpreter-trainers and gives skills enhancement courses for interpreters for the International Association of Conference Interpreters (AIIC) and the European Parliament.